Virtual reality isn't casual. You don't tend to the stir fry while you're in VR. Or argue with your flatmate. Or check Twitter. And so it's not actually that outlandish to think that VR might have a few lessons to learn from the good, old-fashioned theme park. Theme parks aren't casual, either. Rollercoasters demand your complete attention and you literally cannot pull out your phone. Immersive attractions are more like theatre than the TV so it feels wrong to have a chat. At the VRUK 16 festival at Ravensbourne University this week, a few VR creators and accessory makers referenced this very relationship just before The Void - the closest thing VR has to an actual theme park - takes its Rapture headset and vest experience to TED 2016 on 15 February. 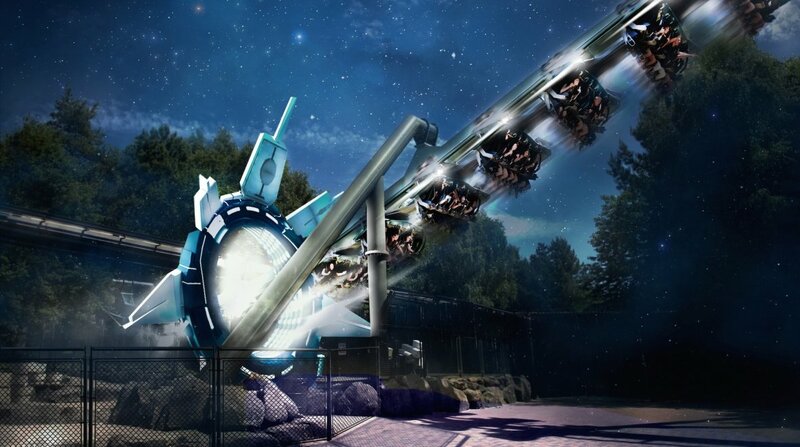 Not only that but two British institutions, Alton Towers and Thorpe Park, are prepping their own VR headset-enabled rollercoasters in the form of Galactica and Derren Brown's Ghost Train. Here's some lessons that virtual reality can take from theme parks and why actually, the living room is no place for a bad ride. Jed Ashforth, a senior designer at Sony Europe, used the theme park experience to describe how the relationship between game designers and players is changing. "What we tend to teach our developers is that the way to direct users in VR is like a theme park," he said. "You go a theme park and you want to go on the big rides. What theme parks do is a very, very brilliant job at exceeding expectations about how that's going to work out. "So while you're queuing up for the ride, before you go on it, you get to see the ride, you get to say 'wow, that looks super intense' or 'no, that's not the right ride for me at all'. You get taken round the ride, you get to see all the parts, you get to see where it does a 360-degree corkscrew at 100 miles an hour and you can still make that decision at that point. At any point, there is a graceful exit to exit from that scenario if you want to. There are exits all the way round. Theme parks are very focused on not giving a single user a bad experience." So rather than game designers, writers and creators seeing themselves as the author of the experience, instead Sony tells them: "you're the host". And these "tour guides" need to remember, especially with horror and thriller elements, to not be rude to the viewers and gamers who have agreed to completely immerse themselves in this world. They also have to let players understand how UI elements work in VR as the lack of a screen with borders also complicates this design. There's also the word of mouth factor - theme park rides still have that element of buzz. We talk about them, we describe purely how they felt rather than deliver pithy one line reviews. And you can't know what it's like to be inside a VR game or on a theme park ride until you do it yourself. "The next best thing to trying it is having someone you know and trust enthusing about how great it is," said Ashforth. "This is the same feeling we want to engender with VR." And in case, you're wondering, the opposite of a graceful exit in virtual reality is yanking the headset off because you don't like the look of that dangerous bridge or scary monster. I have very fond childhood memories of 4D experiences of RoboCop and Honey I Shrunk The Kids at Disneyland. And after a few instances at Sundance Film Festival of experiments with for instance, a D-BOX chair for The Martian VR experience, it's nice to see that Roto VR founder Elliott Myers is on track to launch his ultimate VR gaming chair in June. After a failed Kickstarter campaign last year, Myers has raised the investment to get development of his motorised swivel Roto chair going, which he describes as "turning the user round like on a Disney ride." When you're inside a VR game or movie, Roto tracks your body yaw [orientation] and is able to connect to your head-tracking headset so it knows when to turn your body to face in the right direction within the virtual world. For instance, if you look left but move your joystick on your controller to travel forwards, it knows to 'decouple' your head and your body and spin you accordingly. It's a rumble chair, of course, with a Theme Park feature - of course - and there are touch contacts for your feet so you can take a step. An optional extra is a table mount for keyboards, joysticks, cameras and haptic accessories. The focus though is getting rid of simulation sickness. "I believe 95% of VR experiences will be seated," said Myers. "And if you don't have wires on you, you can physically turn around in VR. Imagine driving in a VR racing game and being able to really turn round a bend. If we can turn in VR, we don't get motion sick." When it launches, Roto will support all the major headsets and a price and release date is coming soon. You can add your name to the pre-order priority list now. Sitting around the TV is the new sitting around the campfire telling stories, but how will VR fit into our living rooms and what will we point our furniture at? That was the question posed by Matt Ratcliffe from Masters of Pie, which we covered for its Big Data VR challenge win last summer and whose new VR tool Geppetto wants to make animation more immediate, hands on and directly manipulated like stop motion. One answer is that we will go to Alton Towers, or The Void, or an arcade to get our virtual reality fix. Or that it will be confined to 'dens' and 'studies' with accessories like the Roto or a marked out area to wander around wearing a HTC Vive. But, nodding to a theme park style scenario, Ratcliffe says that we will categorically not be lined up in individual seats, with individual VR headsets on, in our living room watching movies with our families. That is just not going to be the new TV. Read this: Can Second Life's second life democratise VR? Sony is pushing screen mirroring as a way to make VR more social but there's also the idea of creating "an electric hearth" that isn't restricted to one physical space. VR can create a warm, shared, comfortable space without the group of people being in the same room - Oculus Social and Converge VR are heading in this direction and the limited interactions of the delightful PlayStation game Journey could be a good model to follow. "We want to produce collaborative tools that allow more than one person to operate in the same game world and build these narrative stories," he said. "Actually it doesn't really matter about VR taking over the living room and incorporating it into your living space. What you can do with virtual reality is create your own hearth - your own remote, collaborative, storytelling space."